Sized to fit any 6' rectangular tables. 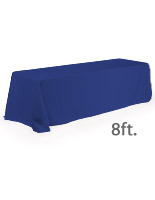 Four-sided table cloth covers from table to floor to hide additional items underneath. Attractive burgundy cloth blends with any environment. Made from 100% polyester to be washable and wrinkle resistant. 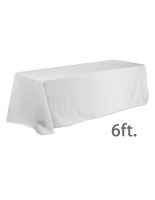 This linen table cover can be used for almost every occasion, from casual to formal events. Change your table from ordinary to extraordinary with this linen table cover. This table throw, linen table cover is made from durable, polyester fabric that is both machine-washable and wrinkle-resistant. Each corner of the linen table cover is rounded, allowing the cover to drape naturally, making the display table look more presentable. 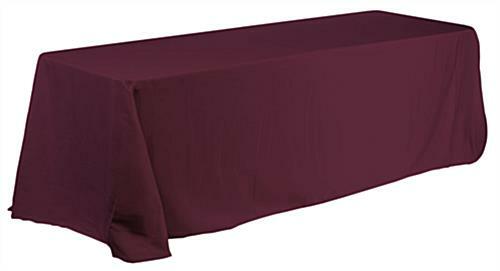 A linen table cover will be a great accessory for meetings, trade shows, banquets, hospitality events and school functions. 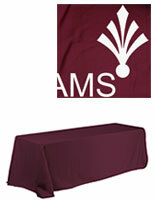 Decorate your dull and unattractive event table with this linen table cover, making it look professional for attendees. 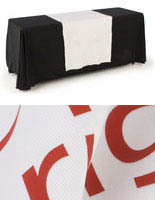 Not only does this linen table cover help to cover the table feet, but it also draws attention and helps provide a more polished look for your booth in large venues. 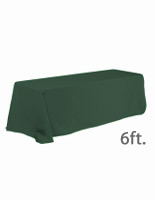 The linen table cloth will cover all four sides of the table, allowing you to store additional items under the table. 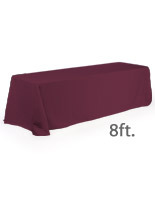 We sell this linen table cover in many other colors as well. A cloth throw, linen table cover is now sold at an inexpensive price. Instead of renting, you can now get this linen cover at an affordable price without going over your budget! We needed a table cloth to take on the road. Plain and simple this one does the job. It covers the whole table, all the way to the floor, all the way around so it looks good from all the way around. And you can put stuff under that table and no one sees it. Love the color and the texture. Easy to wash, if needed. Easy to pack and go. And the price is great as well.